Back Home Gemstone Information Cuts of gemstones | Gemstone information at Rocks & Co. While it would be wonderful if gemstones came out of the ground ready to wear, this typically just doesn't happen. Raw crystals from the earth are usually called 'rough gemstones' (or just 'rough') and this is actually very apt - rough gems can look pretty rough! Faceted Gems: Gems with geometrically-shaped, flat polished faces. Today, faceted gemstones are the most popular style, but this was not always the case. Big fans of cabochons, cameos (a gem carved in positive relief) and intaglios (a gem carved in negative relief), did you know that ancient Romans considered wearing faceted gems vulgar? Non-faceted: Gems that don't have geometrically-shaped, flat polished faces, such as cabochons. Derived from the old Norman French word 'caboche', meaning head, cabochon is an ancient shaping and polishing technique that remains popular today due to the yesteryear charm and character of what are typically, richly coloured gems. Because of their different optical properties, coloured gems do not have an ideal 'brilliant cut' like Diamonds (see the diagram in this section). Which style, cut and shape lapidaries select depends on the type, shape and quality of the rough gemstone. The cut of a gem directly affects its overall value as the cut determines how well a gem returns its body colour back to the eye. The lapidary performs a juggling act between beauty and commercial considerations, such as carat weight retention. For every gem, the lapidary is looking for the best compromise between appearance and size, remembering that the value of the finished gem also depends on its carat weight. Maintaining a gem's critical angle (the maximum angle of refraction) often unavoidably results in a smaller gem. It is important to consider windows (areas of washed out colour in a table-up gem, often due to a shallow pavilion) or extinctions (areas of darkness in a table-up gem, all gemstones possess some degree of extinction) on a finished gemstone's beauty. Sometimes size does matter and big can be beautiful, but this isn't always the case. Beauty will sometimes be sacrificed to minimise rough weight loss and vice versa. How do you tell a good cut from a bad one? No one cut is always more beautiful than another, it's all down to the magic of nature and the artistry of the lapidary. One thing that can confuse is shape versus cut. 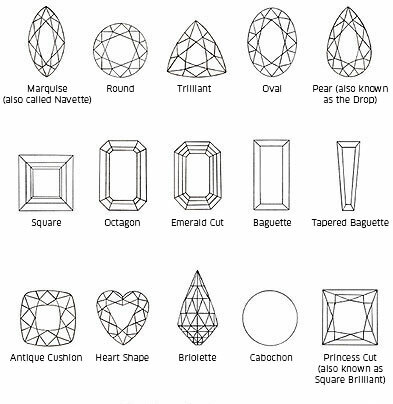 Sometimes they mean the same thing (a 'princess cut' is always square in shape) and sometimes they don't (a 'step cut' can be square, rectangular or octagon). The cut is not just a gem's shape, it is also the cutting techniques (facet arrangements, finish and proportions) used to finish the gem from the rough. A gem's shape will affect the overall look of the gem, but if it's faceted properly, the shape won't necessarily affect its value. The steps in cutting are slicing, pre-forming, shaping and polishing. First, a Diamond-tipped circular steel saw is used to slice the rough gem into pieces. Then it is pre-formed using a vertical steel grinding wheel. The shaper then uses a hand-operated shaping wheel to more accurately present its facets and size. The final step is polishing the gem to reveal its hidden lustre and brilliance. 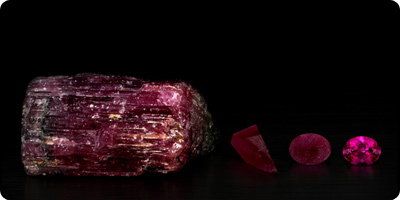 Even, uniform colour with no distinct zoning, unless of cause this is a feature of the gemstone as in bicolour varieties. Remember, gems are designed to be viewed from the table down. Acceptable crown height and pavilion depth. The crown is usually one-half to one-third the pavilion depth. Acceptable brilliance, remembering that brilliance varies amongst different gemstone varieties. Acceptable clarity (amount and location of inclusions), again remembering that acceptable inclusions vary among the different gem varieties. A good polish condition, with no eye-visible scratches or polishing marks. Acceptable pavilion bulge and girdle thickness. Acceptable sharpness of the facet junctions. The majority of the gem's weight is visible from the top. 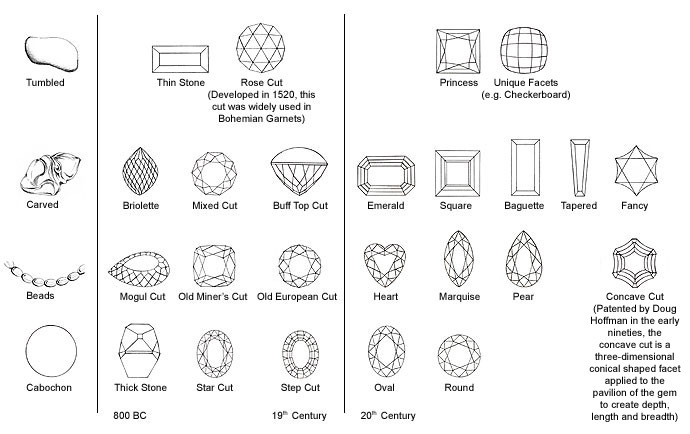 The diagram above shows gemstone cuts from antiquity to the present. True 'artists in stone', lapidary has evolved over thousands of years. During antiquity, cabochons were initially the only cutting style available. Guided by the natural facets of the gemstone's crystal structure, the lapidary cut gems in increasingly more complex ways over time. The earliest of these involved removing the tops of crystals. In the last hundred years, technological advances have allowed cutters to develop some breathtaking innovations.